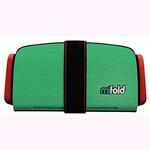 mifold Grab-and-Go booster seat is the most advanced, compact, and portable booster seat ever invented. 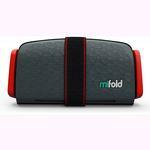 mifold is more than 10x smaller than a regular child’s car booster seat and it’s just as safe. mifold has been regularly crash tested successfully in certified facilities around the world and meets or exceed the Federal Motor Vehicle Safety Standard: FMVSS 213 as defined by NHTSA (the National Highway Traffic Safety Administration). 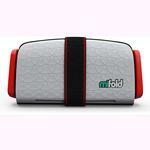 With mifold there is no longer any excuse. With a compact and portable device, a child can easily keep one with them all the time and drivers can keep spares, without cluttering up a car and losing cabin or luggage space. 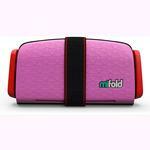 With mifold, a child can always be safe no matter whose car they are in - and that is the mifold vision! FEATURES Comfort: The mifold Grab-and-Go booster seat is engineered to protect children from the age of 4 and up. The patented design takes the seatbelt off the stomach and the neck, making it comfortable, safe and easy to use. The supportive DenseFoam with unique FrictionFabric prevents slipping, stays cool on hot days and is easy to clean. Ease of Use: The mifold Grab-and-Go booster seat can be adjusted to securely restrain children of all sizes. The lap belt guides have three adjustments and the QuickClip allows quick, easy and accurate adjustment for children of all sizes as well as simple, one-handed use, without having to look. Carloads of kids and parents are using their mifold starts and they love it! Compant and Portable: The mifold Grab-and-Go booster seat is more than 10x smaller that a regular booster seat and just as safe*. Measuring only 10”, by 4½”, by 2” and weighing less than 1¾ pounds, a child can easily keep one with them at all times. Drivers can keep spare boosters, without cluttering up their car and losing baggage space. SAFE: The mifold Grab-and-Go booster seat is safety tested and meets or exceeds the US-based Federal Motor Vehicle Safety Standard: FMVSS 213 as defined by NHTSA (the National Highway Traffic Safety Administration). International versions also meet or exceed ECE R44.04 in the EU, and RSSR from Transport Canada.